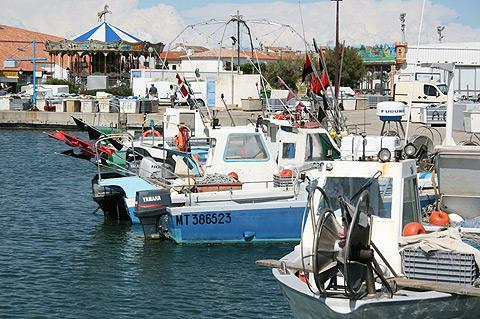 Saintes-Maries-de-la-Mer is at the southern edge of the Camargue, in southern Provence and on the Mediterranean. On a thin peninsula jutting into the Petit-Rhone delta region, the town is almost completely surrounded by water, and numerous beaches and dunes are close to hand, as well as the possibilities of exploring the Camargue region - indeed it is almost the only sizable town in the Camargue. Legend has it that Marie Jacobé, the aunt of Jesus and Marie Salomé were washed upon the shores of Saintes-Maries-de-la-Mer when they arrived from Palestine in the first century AD, thus giving it its name. When she heard that their children were being killed, Sara, their servant, vowed to protect the gypsies of Saintes-Maries-de-la-Mer and in consequence became their patron saint. 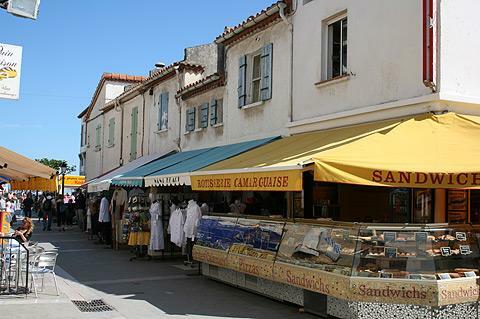 Saintes-Maries-de-la-Mer is a small town, dominated by its church and surrounded by attractive streets of simple white washed houses, many of them now shops focussing on the tourist market. There is a small active harbour in the town to amble around, with a couple of harbourside restaurants etc. The fortified church in Saintes-Maries-de-la-Mer is very artfully lit with halogen lighting, and the stone interior not over-cleaned, making it very atmospheric. You can see the statue of Sara in the church - go to the rear of the church and descend the stairs. 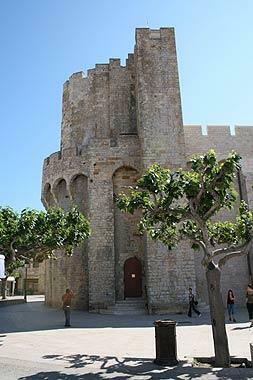 There is then a separate entrance to the side of the church where you can ascend to the ramparts and look out over the town and the Camargue (there is a charge for this part of the visit). Because of its location and history Saintes-Maries-de-la-Mer is not just another beach holiday destination in the South of France, but has a quite unique character. 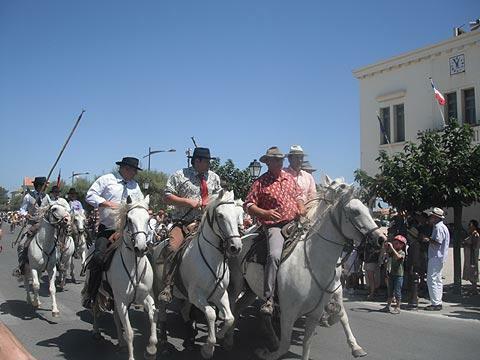 Much of the town’s charm is because it is situated in the beautifully uncultivated Camargue, known for its wild white horses, bulls and flamingos and at first the little town appears to be typically French with groups of friends playing boules in Place de Gitan (the main square), children running down the street clutching baguettes and narrow cobbled streets. This French town however, is also infused with a strong Spanish element. Saintes-Maries-de-la-Mer is a pilgrimage town for gypsies, who gather in great numbers in the town each May to commemorate Sara and the town still holds great importance for gypsies, which explains the strong presence of flamenco music, dress and dance. At night the streets of Saintes-Maries-de-la-Mer can be filled with the celebratory sounds of live Spanish guitar and singing. A popular spot just opposite Saintes-Maries-de-la-Mer tourist office is La Siesta where flamenco music bursts from the little stage at the edge of the café. With its comfy chairs this quirky space is perfect for either an aperitif or a coffee after dinner. The bars either side of La Siesta have live flamenco music too and they are far enough apart that the groups never drown each other out or compete. L’Avenue Federic Mistral is a single street dedicated to restaurants and cafes, several of which have very large full paella pans out the front in order to entice potential customers. A little way off the beaten track but still only walking distance from the centre is Bar de L’Etang in L’Etang des Launes. 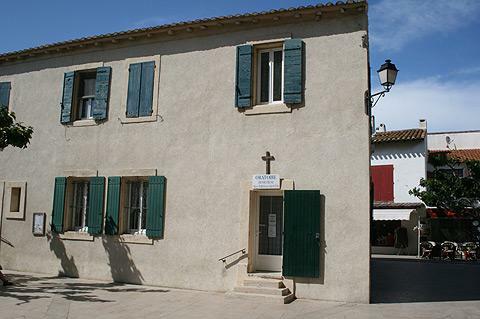 A favourite place amongst both locals and visitors to Saintes-Maries-de-la-Mer is on a corner of Place de Gitan, which is well known for the boules tournaments it holds: the bar-restaurant La Bodega. Its leafy exterior is enchanting whilst inside the ambiance is warm and inviting. There are also larger tables where you can order from a large range of delicious tapas, including octopus, as well as less adventurous options of pizza and salad. Also along the edge of Place de Gitan, Lou Gabian is a real local hangout which locals often flood to after long games of boules. A great way to catch this typically French game, relax and soak up the afternoon sun is to sit outside with an icy beer or coffee at a table overlooking the square. When it’s not packed with people playing boules, the main square holds a market (Monday and Friday) which is yet another example of how both the French and Spanish cultures intertwine. There are stalls selling everything from olives, cheeses and local French wine to flamenco dresses and large brightly coloured hair flowers. Being a town that hosts numerous bull fighting events, there are naturally also stalls selling bull terrine for those brave enough to try it. During the summer there are different events held nearly every night in the arena. For those who want to see easy entertainment there are often concerts by tribute bands and even comedy shows. Another event is Toro Piscine which runs twice a week during July and August and consists of a bull, various participants, a swimming pool and no killing. 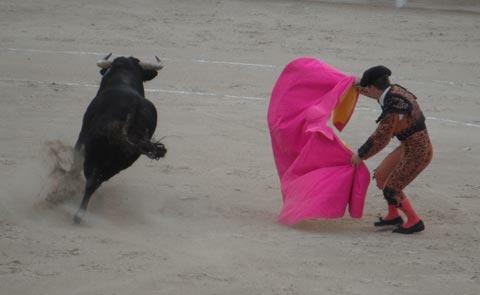 If it’s real culture that you are after however, the Bull Fighting events are incredible and particularly emotive when accompanied by a live flamenco group. Before buying your ticket though, it is important to be aware that you are letting yourself into not only something rich in cultural value but also something very gory and brutal. 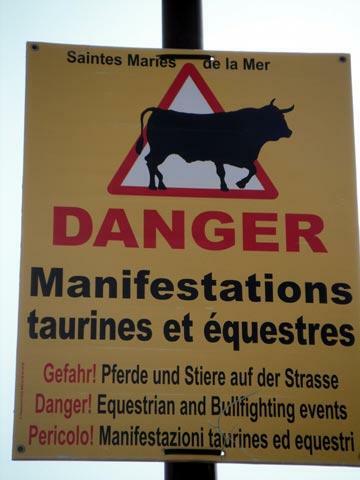 Summer in Saintes-Maries-de-la-Mer is full of activities and there are a number of equestrian shows, bull riding contests and even performances with acrobatics on bulls. 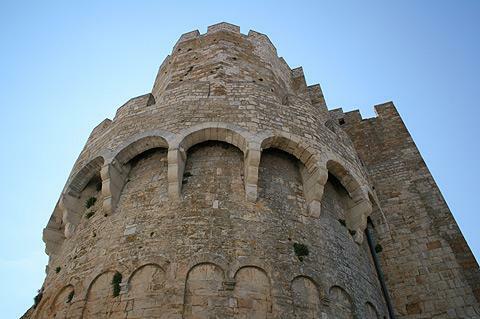 Among the most interesting towns close to Saintes-Maries-de-la-Mer are Aigues-Mortes to the west and Arles to the north-east.